I’ll take a Two Hour Traffic Jam just to get a taste of some Pho Van! 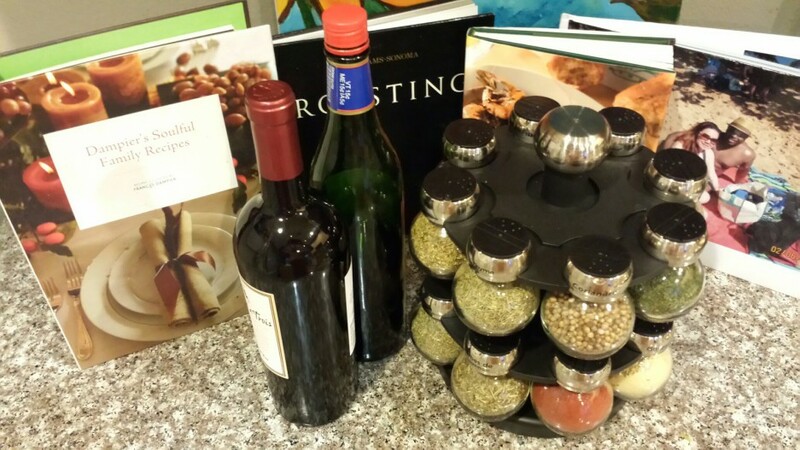 May 15, 2015 May 15, 2015 ~ Trevis Dampier Sr.
It’s Friday and I’m looking for a tasty sinful dish to kick off the weekend! What better way to kick off lunch than with a Kung Fu sodium punch to the face! So it’s time for lunch and my fiance is feeling a cold coming on and wants some soup to help sooth the throat. She looked on Yelp and found a place nearby our jobs with a high star rating so we decided to go on an adventure to Pho Van. Upon driving there, I thought I was going to drive into a construction site since it was basically parallel to the freeway in the industrial area. I thought to myself what kind of place is this where they have a restaurant hidden in the back alley somewhere. Sure nuff. I look and see they are really here in this land of construction and tire distributors. We move forward and journey inside. 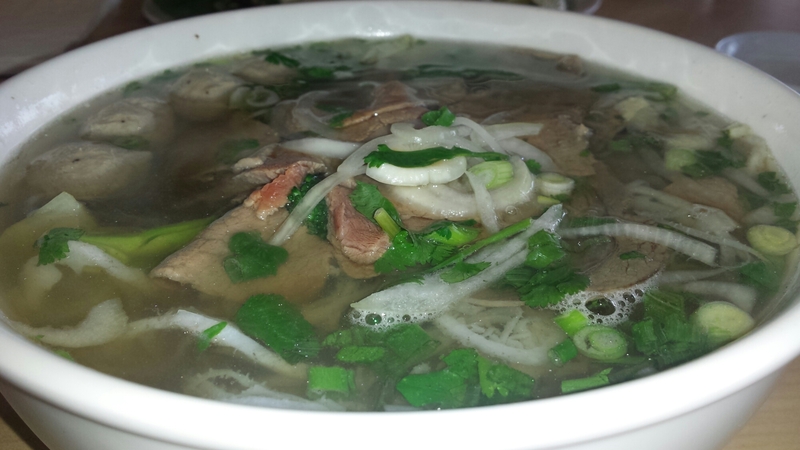 Inside it is presentable and the regular expectations of a Pho Restaurant. Usually they aren’t the most glamorous inside but they put all that glam in their soup broths so don’t be alarmed. I usually order the fully loaded Pho soup so I can get all of the different textures of meats that are available, like tripe, beef, and meatballs. I saw that they had this meat lovers soup available so I went with that. A tip for those on a low carb diet like myself – Ask to change the noodles to vegetables and now you have a fully loaded soup and you don’t have to feel so guilty. Once we ordered, I looked for my chopsticks and soup spoons which are usually right at the table packed up in a tin case next to you and it is empty. Hmmmmm. To my surprise, they bring us brand new chopsticks and fresh,clean soup spoons which is rare at Pho restaurants. I was impressed with that. 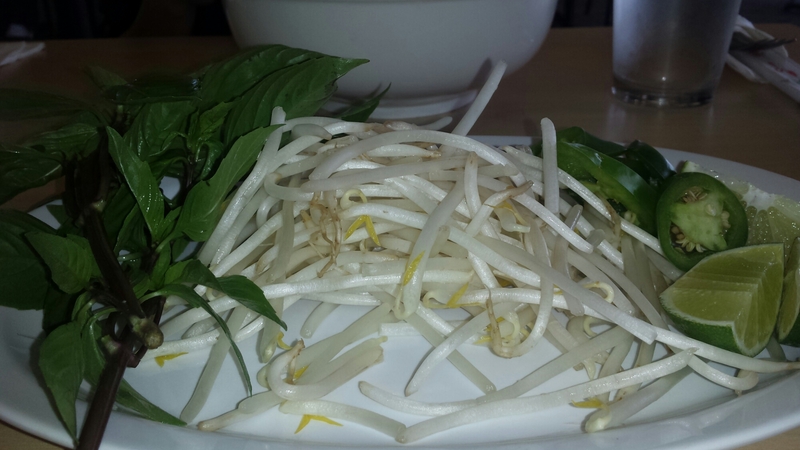 Then they bring the add on items, lime, bean sprouts and basil which look extremely fresh as well. Good job! Once I received the soup, I see a fully loaded meatball, beef and tripe masterpiece! The colors were elaborate because of the veggies and I dive in right away. The broth smacks me with a unique delicate and noteworthy flavors. One of the best broths I’ve tasted! Each bite was filled with numerous textures and the meatballs should be saluted for tasting so plump and delicious! I can eat them on a dish on their own. True live action eating! Good job Pho Van! I want to thank you for joining me on today’s adventure! I look forward to seeing you on the next run! Keep hope alive! < Previous I’ll Travel the Grand Canyon on a Bike to get to a Chicken Sandwich at Ike’s!! Next > Make no Mistake….I love me some Cheesecake!